Gamers around the world are getting ready to mouse-click the night away with the midnight launch of Diablo III. The action RPG, first announced in June 2008, will be available for PC and Mac at 12:01 a.m. Pacific time on May 15 in the Americas, Australia, New Zealand and South East Asia. Other launch times for Diablo III will vary by region. If DVD installation is your only option, many GameStop locations are holding midnight launch events. Plug in your zip code at Gamestop's Website to find participating locations. But keep in mind that Diablo III requires a broadband Internet connection to play, so a DVD won't help if your computer can't get online. Blizzard has posted minimum and recommended Diablo III system requirements on its Website. I won't re-post them all here, but most desktops and gaming laptops released in the last few years shouldn't have a problem with the game. The game will run on Windows XP or newer, or Mac OS X 10.6.8 or higher. Again, the game requires a broadband Internet connection to play. Diablo III tells a typical fantasy story: Players must fight against a demon onslaught with a hero from one of five character classes--the slow but powerful Barbarian, the crossbow-wielding Demon Hunter, the quick close-ranged Monk, the minion-summoning Witch Doctor and the spellcasting Wizard. Players can also fight alongside a computer-controlled follower in single-player, or in cooperation with other players online. The game is controlled mostly by mouse, with players pointing and clicking to move and attack the enemy, though many keyboard shortcuts are available. By killing demons and completing quests, players earn new items and skills to make their character stronger. For a detailed look at Diablo III's ability system, check out David Sirlin's excellent rundown. 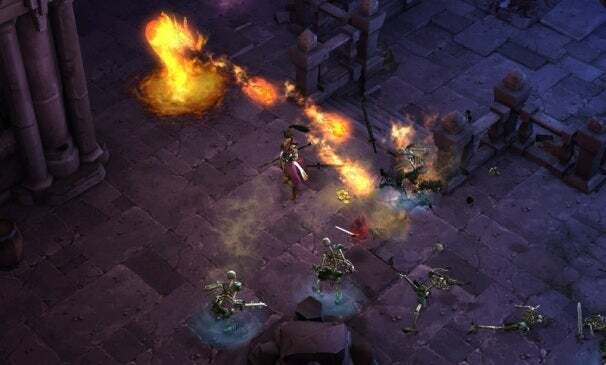 In short, Diablo III lets players change their special abilities at will, a departure from previous games that allows for lots of experimentation with new powers. 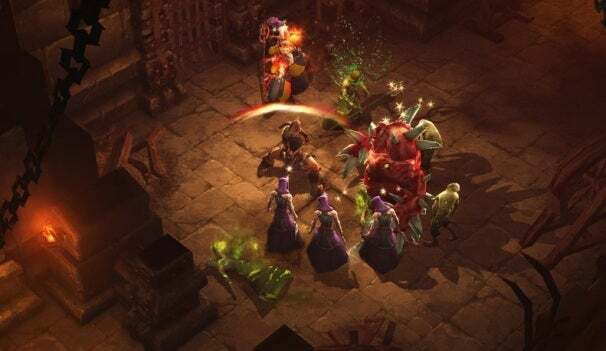 Outside the actual game, one of Diablo III's more interesting additions is Auction House, a place where players can buy and sell items from one another. Players can use in-game currency on the market, but a separate section of Auction House will allow them to trade with real-world money. I've heard from other writers that Blizzard didn't offer early Diablo III review copies to the press. That means you won't see any reviews of the finished game for at least a few days, as critics grind their way through the game along with the masses. You may see some reviews based on the beta, which only allowed characters to reach level 13. For more detailed reviews on the later stages of the game, be prepared to wait.